I wasn't too worried. He's a boa after all. However, he had never eaten F/T, only stunned, and he's new, etc, so I'd be lying if I didn't say I was happy as a pig in crap when he ate that F/T mouse without even striking! I posted on Kenny's thread that we got them the same day. Pretty cool man. They are practically brothers now . Thank you cletus. He rocks. Amazing animal. Couldn't be happier. 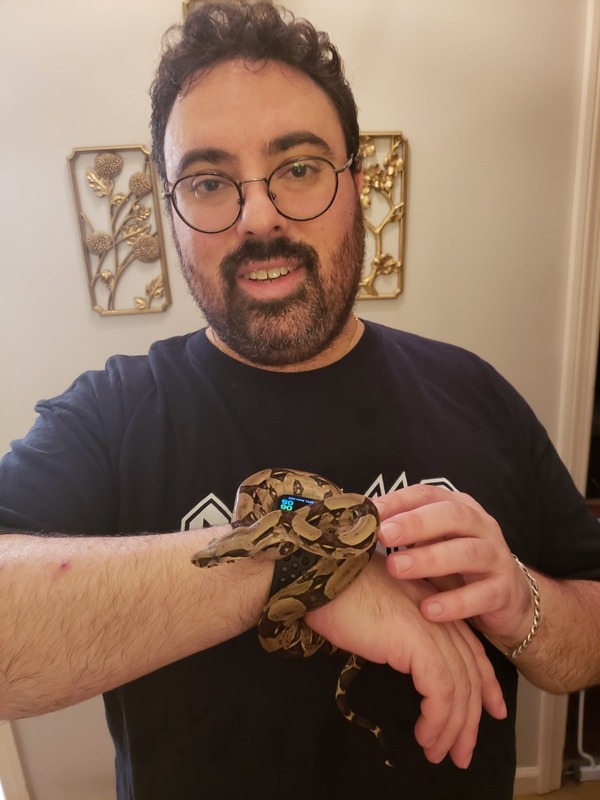 Took Feliz out for a couple of minutes today and he's fully digested (not surprised as the meal was small for him and he's been in the warm hide). Two pictures below of me holding him that Katie took. 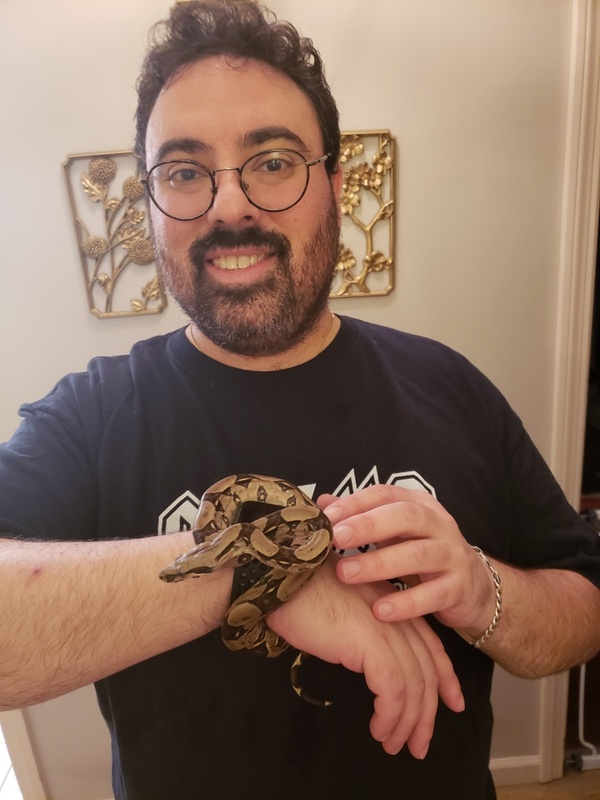 He's such a sweet guy, but also, getting brave and showing that Boa curiosity. When I put him back, I showed him his water bowl and he started drinking. I shut the tank doors and got a good video of him drinking, well, until I slipped and banged the phone against the glass doors and scared him. For what's worth, after I put the phone down he finished drinking and seemed no worse for the wear. I love watching snakes drink; so cute. Last edited by tttaylorrr; 11-15-2018 at 09:13 PM. I felt really bad! However, it didn't bother him for long and he went right back to drinking! I love watching them drink too, it's mad how much they drink in one go sometimes. I had showed him before, but this time, when I showed him the bowl, he was like, "Oasis!" He drank half the bowl over 4 minutes or so! I've seen Behira do something similar; act like she's never seen water before. They can really go to town when they are thirsty. When I "startled him" he was more like, "This is my house, and I am drinking, what do you want?" than scared I think. The fact that he went right back to drinking seconds later tells me he's feeling pretty good in his (quarantine) tank. Speaking of that. I sent the breeder the picture I posted here of him eating. He said he really like the setup and wished all his animals had setups so nice. I laughed and told him that was his quarantine tank! Wait until he sees the Boaphile he will live in for life. Honestly, it won't look that much different. Bigger bowl, more hides for now, and ultimately bigger hides, etc. I told him I go for cleanliness and function over aesthetics. The snakes don't care as long as their needs are met. My bragging rights are not on how cool my tanks look, but rather how clean they are, and how happy and adjusted my reptiles are.